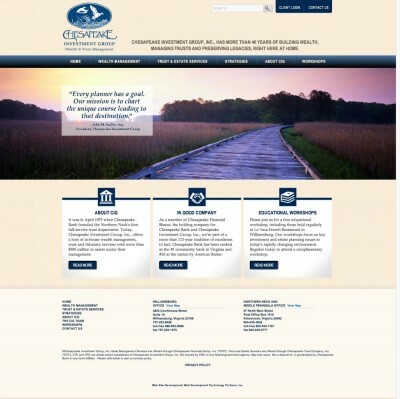 Portfolio - Web Development Technology Partners, inc.
Chesapeake Investment Group, Inc., offers a host of in-house wealth management, trust and fiduciary services with more than $300 million in assets under their management. Chimera International Corporation (CIC) was created to optimize the operations of freestanding dialysis clinics in the Americas. Our goal is to provide our clients with the capabilities to serve the highest quality of care in the most cost effective method possible. 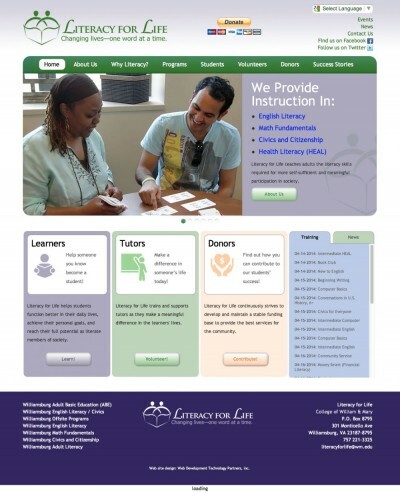 LMA required both a public web site redesign and extensive back-end development to create a new electronic Liz Moore Office (eLMO). 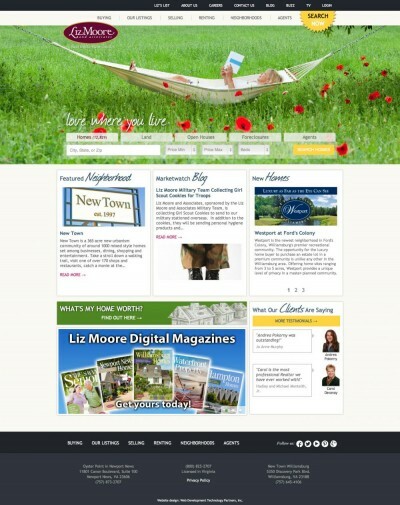 For the 2011 site redesign we launched a new contact management system dubbed CONNECTIONS - The Liz Moore Relationship Management System. The new public web site delivers a pleasing visitor experience and ties in to the eLMO system for tracking of all web initiated contacts. 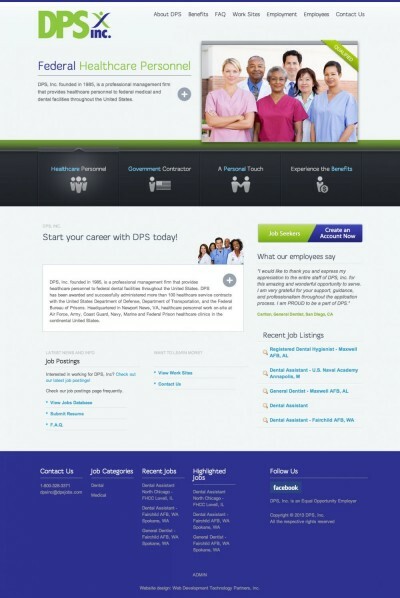 DPS, Inc. founded in 1985, is a professional management firm that provides healthcare personnel to federal medical and dental facilities throughout the United States. W.I.S.E. 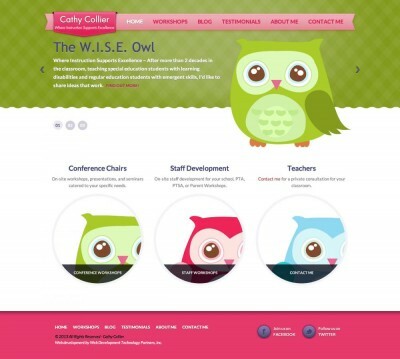 - Where Instruction Supports Excellence ~ After more than 2 decades in the classroom, teaching special education students with learning disabilities and regular education students with emergent skills, longtime teacher Cathy Collier shares her time tested ideas that work. The McCormack-Nagelsen Tennis Center is situated on South Henry Street, adjacent to the Marshall-Wythe Law School, on the campus of William & Mary. This award-winning facility boasts six indoor, climate-controlled courts and experienced USPTA instructors who are ready to help take your game to the next level. From junior tennis programs, to adult leagues and private lessons, the McCormack-Nagelsen Tennis Center has a program available for you! 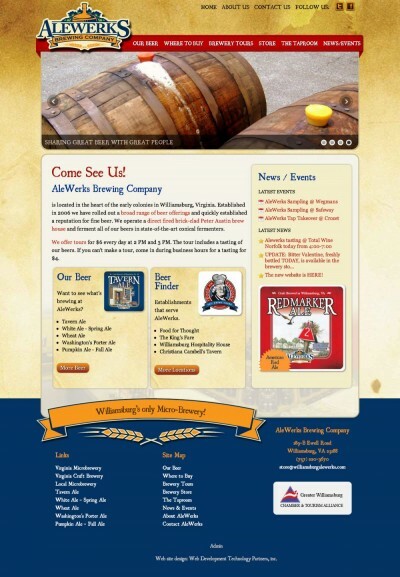 AleWerks Brewing Company is located in the heart of the early colonies in Williamsburg, Virginia. Established in 2006, AleWerks has rolled out a broad range of beer offerings and quickly established a reputation for fine beer. AleWerks operates a direct fired brick-clad Peter Austin brew house and ferments all of their beers in state-of-the-art conical fermenters. Vickerman & Associates provides unparallelled industry knowledge and expertise in strategic master port and intermodal planning and design. The global marketplace demands goods be moved quickly, reliably and efficiently at competitive rates. Ports and intermodal terminals are critical nodes in a vast transportation and supply chain system. 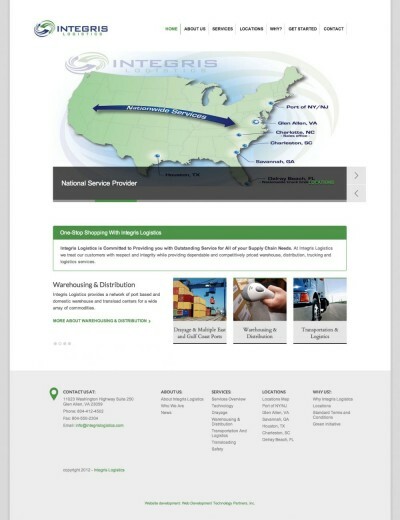 Integris Logistics is Committed to Providing you with Outstanding Service for All of your Supply Chain Needs. At Integris Logistics we treat our customers with respect and integrity while providing dependable and competitively priced warehouse, distribution, trucking and logistics services. 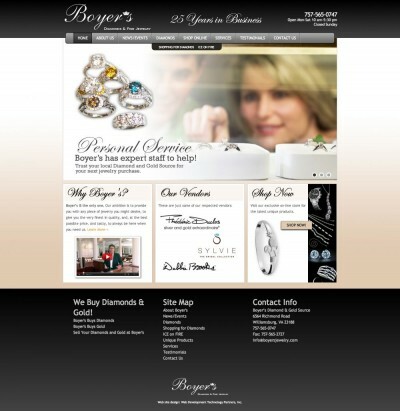 Boyer’s Gold & Diamond Source is a full line jewelry retail store with services that include repair, custom design, and gold and diamond purchasing. 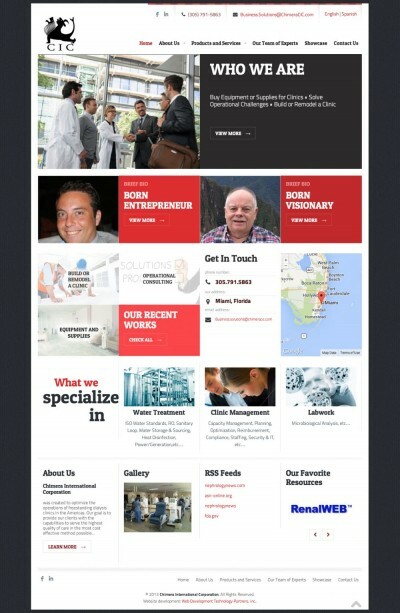 Boyer’s brick & morter customers are thrilled with Boyer’s but had suggested their old website was outdated. 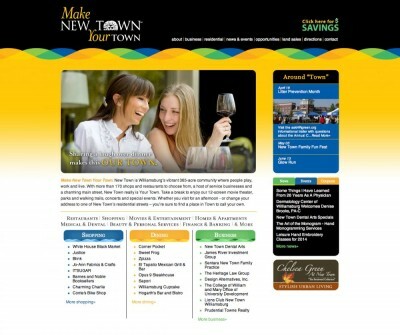 WDTP delivered a modern design with an emphasis on visual appeal. The site includes arobust e-commerce storefront with a complete Content Management System focused on ease of use. 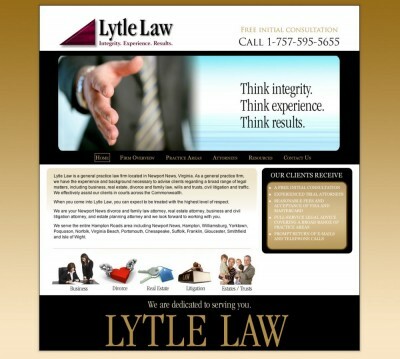 Lytle Law is a general practice law firm located in Newport News, Virginia. As a general practice firm, we have the experience and background necessary to advise clients regarding a broad range of legal matters, including business, real estate, divorce and family law, wills and trusts, civil litigation and traffic. We effectively assist our clients in courts across the Commonwealth. 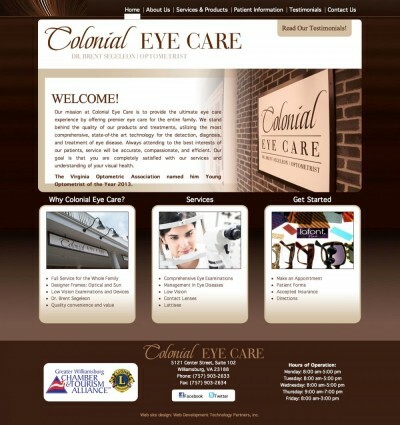 Colonial Eye Care provides the ultimate eye care experience by offering premier eye care for the entire family in the Williamsburg, VA area. 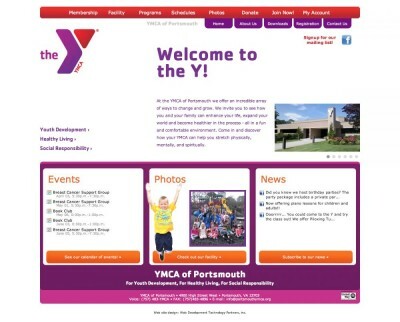 The YMCA of Portsmouth is a small independent branch of the national YMCA. With the rebranding of the national YMCA into The 'Y', it was a good time for a facelift. 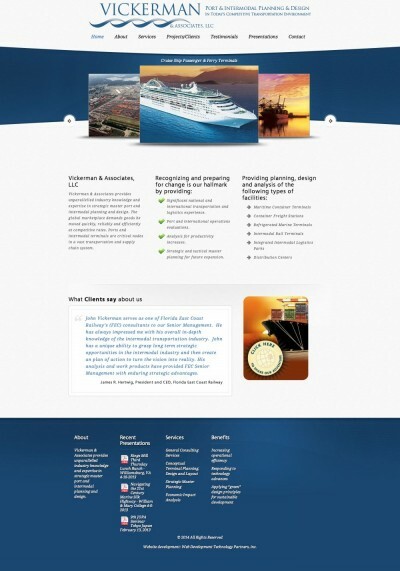 WDTP delivered with a modern look to match the national guidelines and increased user friendliness and maintenance flexibility. We saved cost and increased functionality by leveraging Google and Facebook web services. Literacy for Life teaches adults the literacy skills required for more self-sufficient and meaningful participation in society. 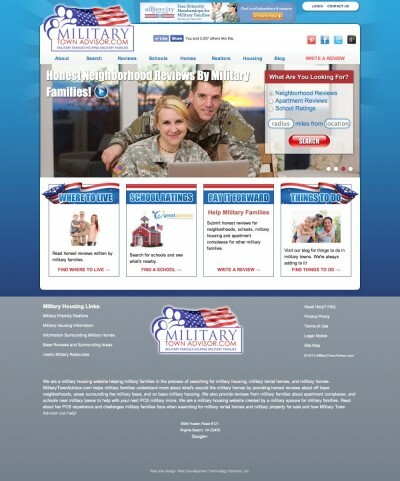 MilitaryTownAdvisor.com is a PCS relocation resource and military housing site that allows military families to help other military families by writing reviews about military towns. When searching for information about where to live on our military housing site, read reviews about military housing, off base neighborhoods, areas surrounding the base, apartment complexes, condominiums, and schools. David A. 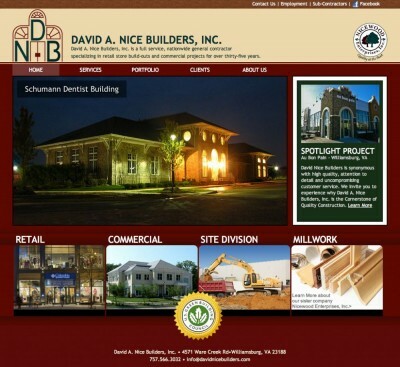 Nice Builders, Inc.
David A. Nice Builders, Inc. is a full service, nationwide general contractor specializing in retail store build-outs and commercial projects for over thirty-five years. Merchants Square is a unique shopping experience near Historic Colonial Williamsburg, VA. With its conception dating back to 1927, Merchants Square is recognized as one of the earliest, if not the first planned shopping districts in the United States. 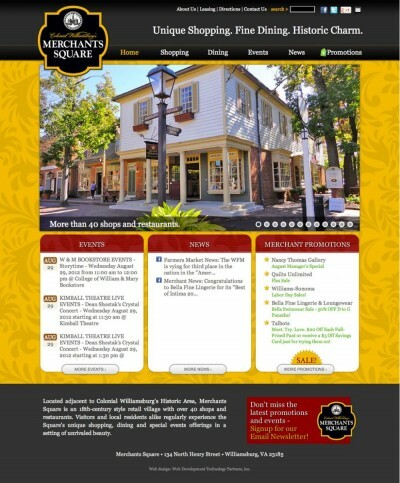 WDTP.com delivered a new site design that both engages the public and provides critical editing capability for each business in Merchants Square. 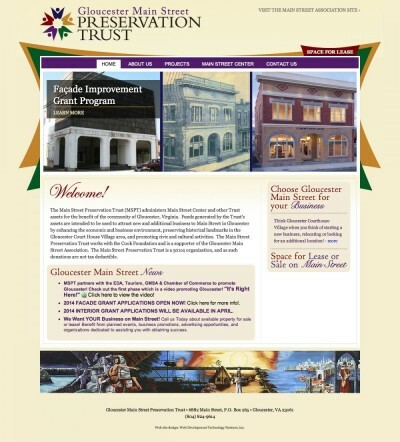 The Main Street Preservation Trust (MSPT) administers Main Street Center and other Trust assets for the benefit of the community of Gloucester, Virginia. Funds generated by the Trust’s assets are intended to be used to attract new and additional business to Main Street in Gloucester by enhancing the economic and business environment, preserving historical landmarks in the Gloucester Court House Village area, and promoting civic and cultural activities. Deborah Doane offers design and decorative elements catering to sophisticated buyers seeking classic style and beautiful objects. 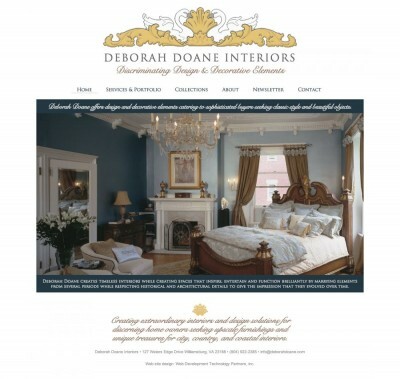 A graduate of Virginia Commonwealth University and early design experience with Miller & Rhoads, Laura Ashley and Ethan Allen lead to opening a retail store in 2004 in Richmond, VA. Deborah came to WDTP to establish a web site for her new business as an interior designer and consultant. 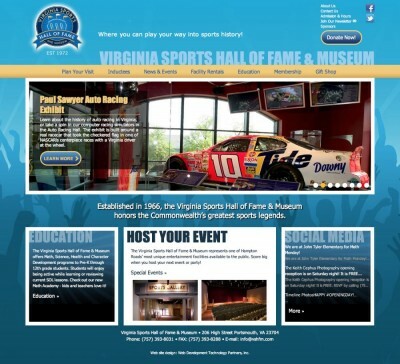 Established in 1966, the Virginia Sports Hall of Fame & Museum honors the Commonwealth’s greatest sports legends. 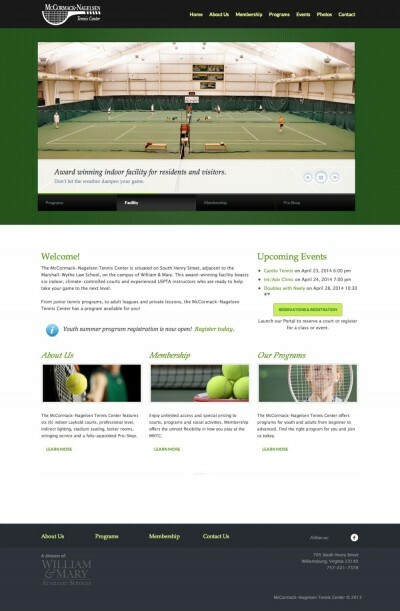 In need of a redesign, WDTP delivered a fresh new look with a complete overhaul of the Hall of Fame, converting it into an online database with multiple photos per inductee for a richer experience. For over 50 years, CrossGlobe has provided fast, efficient, trusted transportation services to producers of specialized products that need expert care and handling. 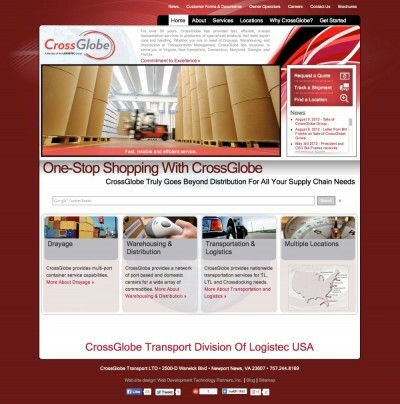 Whether you are in need of Drayage, Warehousing and Distribution or Transportation Management, CrossGlobe has locations to serve you in Virginia, New Hampshire, Connecticut, Maryland, Georgia, and Florida. The King’s College at Jamestown strives to provide ministerial education based on the traditional commission to teach the world the undiluted Word. KCJ's objective is to provide the serious student with the necessary learning to provide leadership in the battle for and preparation for the return of our Lord. New Town Williamsburg has more than 170 shops and restaurants to choose from, a host of service businesses and a charming main street. 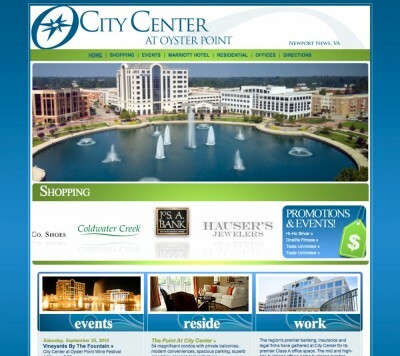 City Center at Oyster Point in Newport News, VA is a vibrant community of luxurious apartments, distinctive condominiums, modern office buildings, and exciting and unique retail shops. 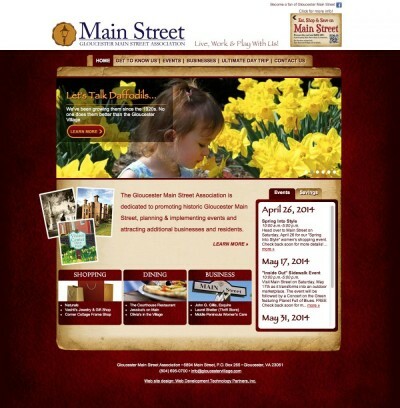 The Gloucester Main Street Association is dedicated to promoting historic Gloucester Main Street, planning & implementing events and attracting additional businesses and residents. 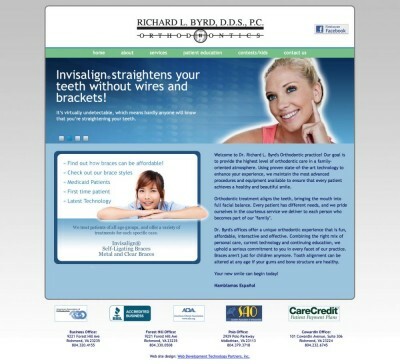 Dr. Byrd’s offices offer a unique orthodontic experience that is fun, affordable, interactive and effective. They contracted with WDTP to establish an Internet presence from scratch that conveys the right mix of personal care, current technology and continuing education, that reflects their serious commitment to their patients. 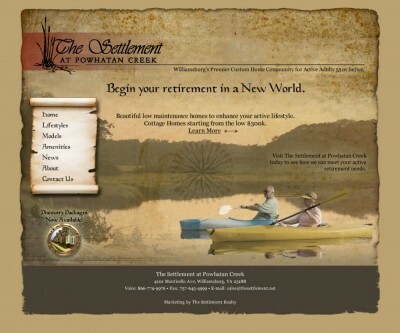 The Settlement at Powhatan Creek is Williamsburg, VA's premier custom home community for active adults 55 or better. 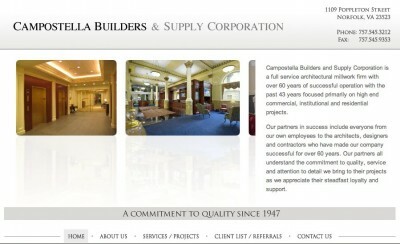 Campostella Builders and Supply Corporation is a full service architectural millwork firm with over 60 years of successful operation with the past 43 years focused primarily on high end commercial, institutional and residential projects. 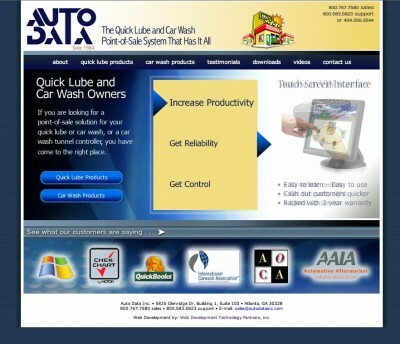 Auto Data Car Care Software Solutions is the original point of sale software for the car care industry.